The great thing about the show gardens at this year’s Chelsea Flower Show was that they were all completely different. Yes, there were common threads – a preponderance of pines, the full gamut of red metals and exceptional visions of nature – but every design took a different angle on garden making. There really was something for everyone; one could validate this by the number of different gardens where visitors confided to one another “this one’s my favourite”. Yet the garden I kept returning to again and again was the Winton Beauty of Mathematics Garden designed by Nick Bailey. As the light changed from the cool, dappled shade of morning to the uncompromising glare of midday and back to the golden glow of evening, this richly textured garden revealed its many faceted quality. Endowed with a wealth of rare and interesting plants and bestowed with great structure, Winton Capital must have been delighted with the return on their investment. Although only awarded a silver-gilt medal by the judges, this garden could have been no more than a hair’s breadth away from the gold it so richly deserved. 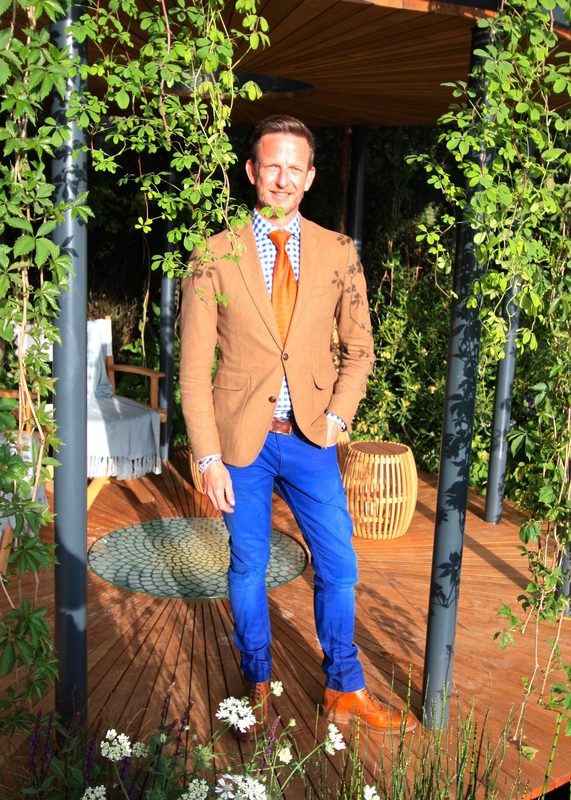 No matter, Nick Bailey is a man with many strings to his bow and this, his first Chelsea show garden, will have cemented his career both as a garden designer and TV presenter. Nick has the casual smartness and ringing timbre that suits the modern-day BBC. His recent slots on Gardener’s World have been a hit. At first one might imagine demonstrating the beauty of mathematics through the medium of a garden to be a pretty tough gig. Not at all it turns out. Every plant is driven by mathematical algorithms and many display these outwardly in the way their trunks, stems, leaves and flower petals are arranged. Nick based his design on the symbol for infinity (∞), using a band of copper, cut through with complex plant algorithms, as the sculptural form sweeping a figure of eight through the space. These symbols and equations were illuminated at night, something few people would have been lucky enough to witness. Nick’s garden was always going to win my heart, using as it did plants of structure and character from around the world. The complete plant list is staggering – surely the longest of any Chelsea show garden – and is summarised in my preview post. Behind the belvedere and the steps leading up to it there was a forest of eucalyptus, banksia and Ceratonia siliqua (carob). 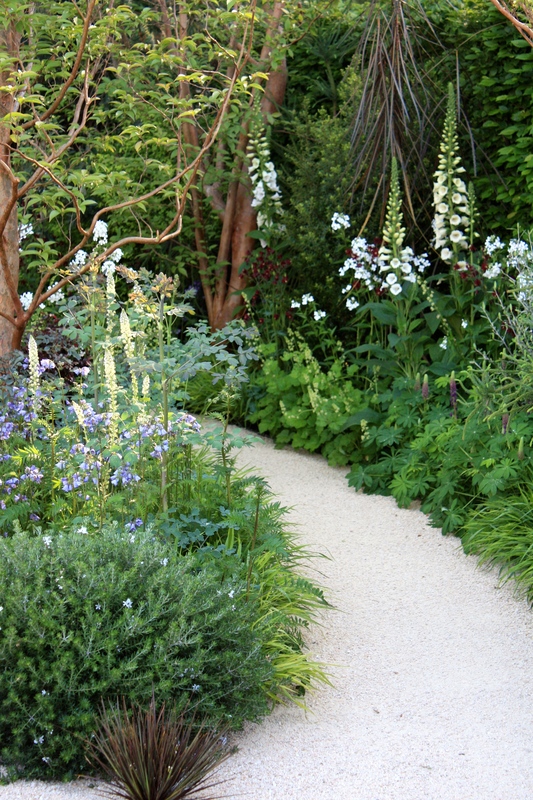 Then to the left we were treated to a dense planting of perennials including Lupinus “Masterpiece”, Polemonium ‘Bressingham Purple’, Cerinthe major “Purpurascens”, Campanula ‘Summertime Jazz’, Allium atropurpureum and Hesperis matronalis “Alba”. Towards the middle and front of the garden the planting became more eclectic, picking up the copper tones of the sculpture and mingling that with complementary blues, whites and purples. Here could be found bearded iris I. “Kent Pride”, Calendula officinalis “Sherbet Fizz”, Geum “Mai Tai”, Reseda ordorata and Helichrysum bracteatum ‘Scarlet’. Finally, at the front of the garden, taller plants gave way to bushy Westringia fruticosa, Aeonium arborescens “Zwartkop”, Elegia capensis and tufty Libertia “Taupo Blaze”. The ultimate low growing plant, the fabulous flat-topped aeonium, Aeonium tabuliforme, featured at the very front of the plot where visitors could appreciate the intricacy of its overlapping prostrated leaves. If there had been one garden I could roll up, tuck under my arm and take home to Highgate it would have been Nick’s. Whilst many of the plants used were a little tender for most parts of the UK, and would certainly be intolerant of our dense London clay, they might have stood a good chance in the warmth of the capital’s urban heat island. The only part of the design which didn’t please me as much as the rest was the very front, bordering Main Avenue, where the very pale gravel screed was so clean and bright that it looked a bit too manufactured. A small niggle which I was more than happy to overlook. It pains me to think this garden will be dismantled tomorrow, but it will live long in the memory. Hats off to Winton Capital for helping us all to appreciate the beauty of mathematics and introducing us to the exciting talent that is Nick Bailey. 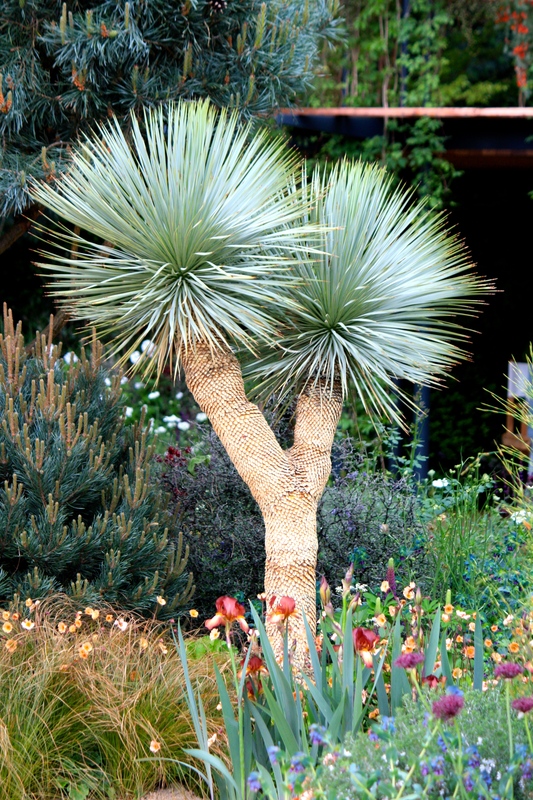 Yucca rostrata (beaked yucca, silver yucca, Adam’s needle): This fine, tree-like plant from Texas and New Mexico played a starring role in Nick’s garden. Yuccas display mathematical patterns, akin to a pineapple’s scales, on their trunks and in their leaf arrangements. Borderline tender in the UK and would need exceptional drainage to survive. Pinus sylvestris “Glauca” (blue Scot’s pine, shown top of post): The “top worked” pines in Nick’s garden produce beautiful cones displaying perfect Fibonacci spirals. Unlike other plants in the garden this one is perfectly hardy in all parts of the UK. Stewartia pseudocamellia: A japanese tree of great grace and beauty, Stewartia pseudocamellia has single, white peony-like blooms and smooth copper bark. Nick chose stewartia because of the colour of its trunks and its perfectly divided seed pods. Eucalyptus camaldulensis (red river gum): hidden away behind the belvedere these towering giants were chosen to demonstrate how eucalyptus trees change their internal algorithms dramatically when they move from youth to maturity. The foliage on younger trees will be round, and on older trees, sickle-shaped. Eucalyptus camaldulensis is considered the most widely planted exotic tree in the world, though not suitable for smaller gardens. 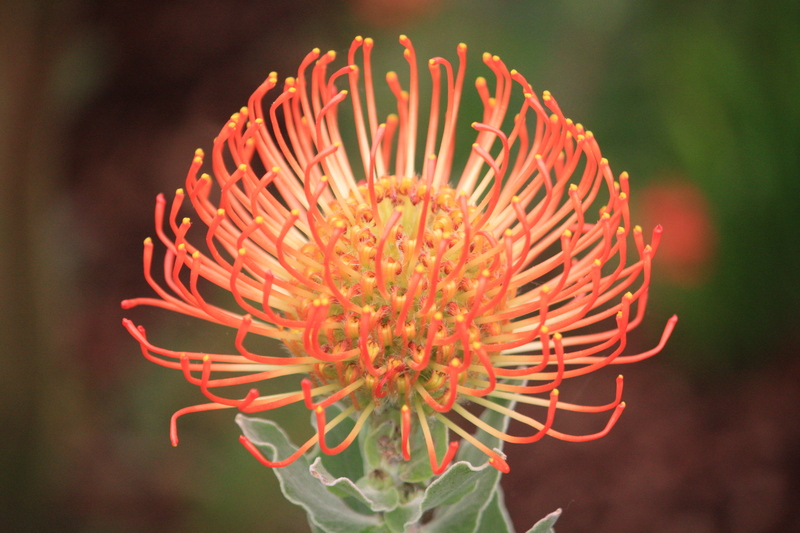 Leucospermum cordifolium (pincushion): Related to the proteas and hailing from South Africa, these tender shrubs produce brightly coloured flowers arranged in perfect Fibonacci spirals. Requires frost protection in a cool greenhouse over winter. Corokia cotoneaster (wire netting bush): The L-system (please don’t ask me to explain!) drives a plant’s stem arrangement. This disagreeable looking New Zealand native creates near perfect heptagons with its twisting, turning stems. 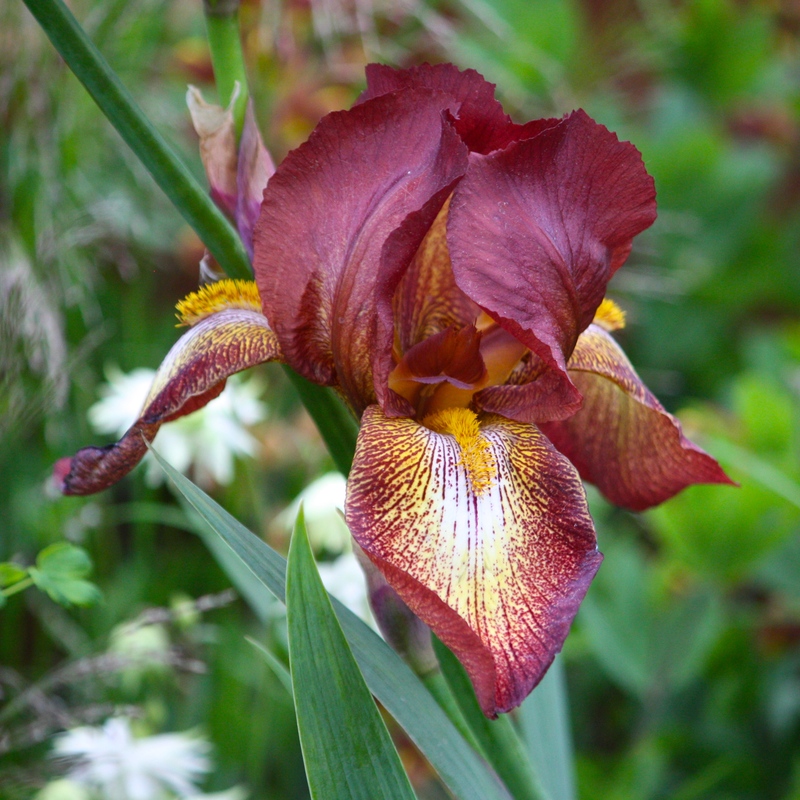 Iris “Kent Pride”: the flowering plants in Nick’s garden represent the way in which plants make sensitive calculations all year round to determine when they should flower. Sunshine, warmth, day length, competition and nutrient availability are among the factors that may trigger a plant’s inner mathematician. Aloe polyphylla (spiral aloe): from the tiny kingdom of Lesotho this beautiful succulent creates the most perfect Fibonacci spiral of any plant in the world. Needs cool air and bright sunshine to thrive, so might grow well in the UK given the right conditions. 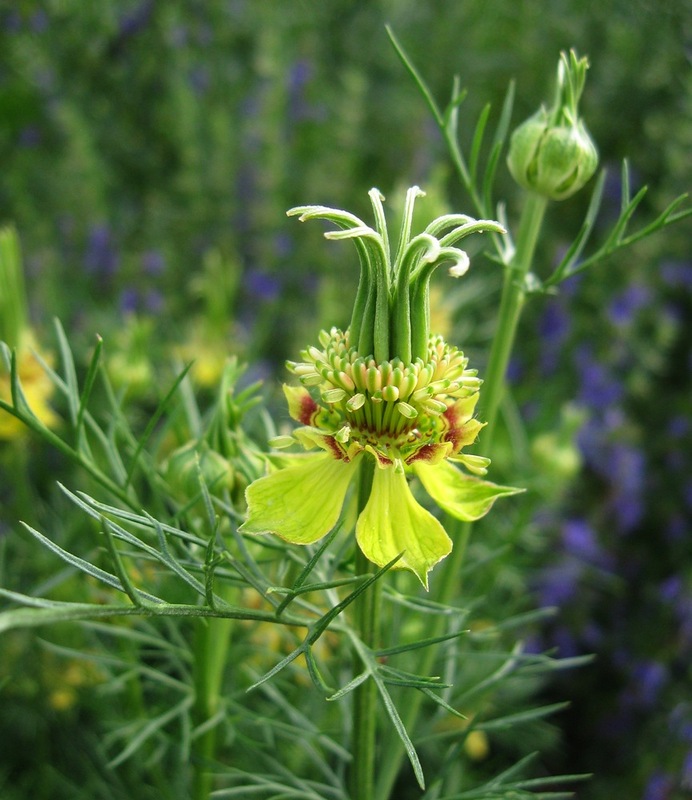 Nigella orientalis “Transformer” (love-in-a-mist): This diminutive annual inspired the design of the garden’s belvedere. Unlike other nigellas, N. orientalis “Transformer” produces a curious crown of sickle-shaped seed pods. Thank you for a brilliant article which is a great record of a truly wonderful garden. I only saw the lighting effects this evening on tv and now in your blog….yet another dimension. There was nothing in it that was anything other than perfect. I too saw the bit about the gardens in the evening. 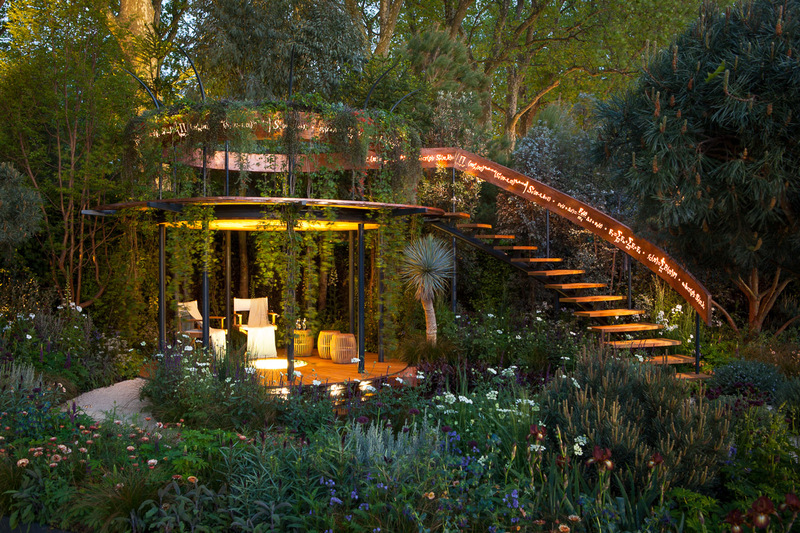 I think they should do a Chelsea “late night” event so that people can enjoy the gardens at twilight. The sponsors must go to a lot of expense to put the lights in so someone should enjoy them, not just the corporate bigwigs that entertain their clients when the show closes to the public. You do indeed have some great photos of this garden, Dan! I don’t think mine are anywhere near as good. Thanks Janna. I tried my best. There are very many rejects! 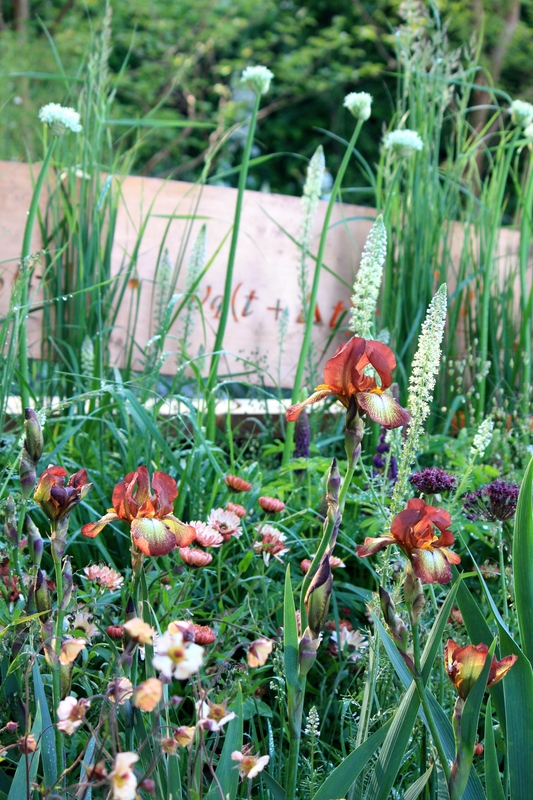 Thank you for doing a fab job of showing us the beauty and creativity of the Chelsea Flower Show, especially the little details we would not find else where! I am saving your posts to savor : ) Cheers! Thanks for sharing your Chelsea views! It’s Geum “Mai Tai” Val. The chocolate vine is wonderful. Quite vigorous though. Have a lovely weekend. Thanks, must look out for both. Thank you, and the same to you! Alas that is the only shot that isn’t my own. I took it from the Winton Capital website. The evenings are so long now that it isn’t properly dark until after the show has closed. What a beautiful garden. The copper, bronze,purple,blue plantings are wonderful. Wish I had the imagination to be able to put a planting plan together like this. Maybe my inability with anything numerical explains why I can’t. ,I am with you, I wish I could pack it up and drop it into my front garden. Thanks for sharing such a detailed and informative post Dan. It’s nearly as good as being there! I would imagine a lot of the plants in Nick’s garden would grow for you in Melbourne? Perhaps not the foxgloves – they would fry. I have a couple of other gardens to report on that used a lot of Aussie plants. By the time I come to visit I might recognise a decent number of them! Lovely garden, lovely pics, thank you! Always enjoyed teaching the more creative aspects of Maths to young children, the Maths in nature is very beautiful. Must look out for Iris ‘Pride of Kent’ if I can find a space for it. Did manage to find some Nemesia ‘Wisley Vanilla’, thanks for the tip. I watch Chelsea from far away British Columbia, Canada. As ever, it delights me to witness the British celebration of gardens and gardeners. The Beauty of Mathematics garden was unique, magical and stunningly beautiful. I watched every video I could find on its creation and concept. Truly unforgettable. Thank you for your posts. Loved reading your insightful comments after watching TV reports. Hi Pauline. Thanks for checking in from Canada! Great that you follow Chelsea and found something of interest on my blog. 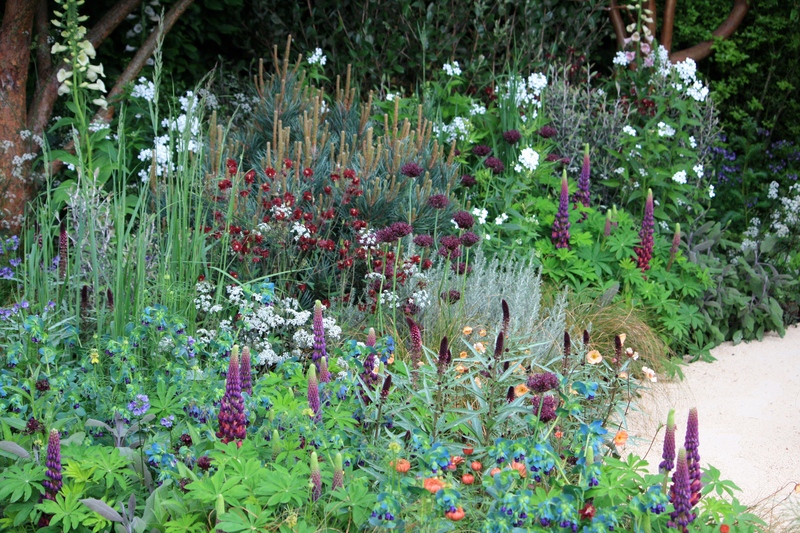 It was a super garden and a great year for Chelsea all round. 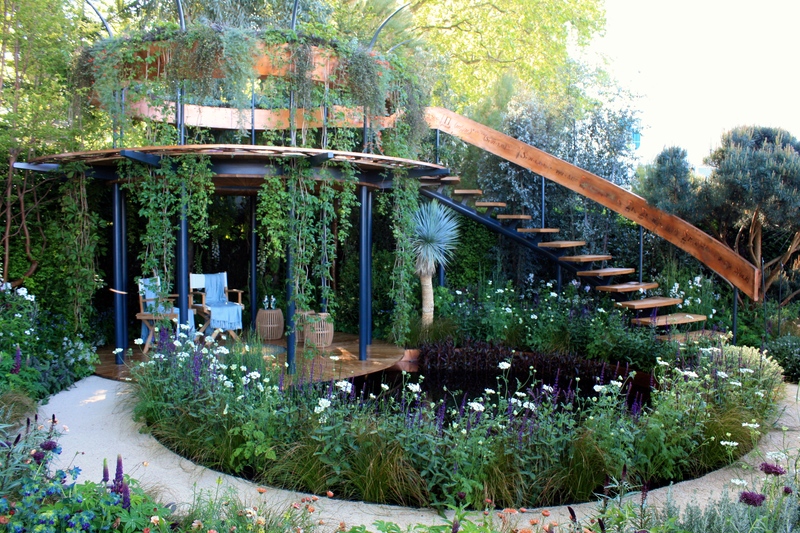 A garden to make you think…I like it! Have just seen the BBC on youtube detailing this garden and noticed there was the plant we call shivery grass planted. It grows wild here and I love it, so very pleased to see it recognised. Might just dig some up and pop in my garden. 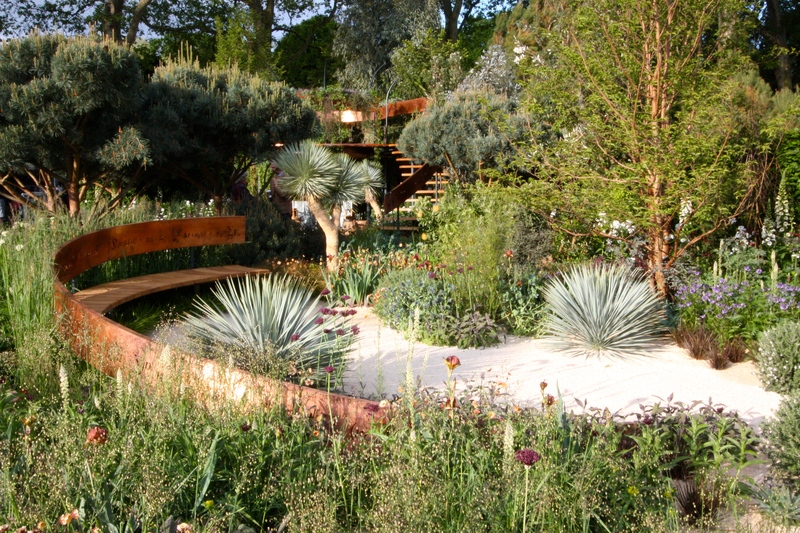 Rather surprised to see the garden received a silver gilt and clearly Nick wasn’t thrilled. We went to a talk by Nick at the Chelsea Physic Garden last night and he said it was down to sections of the path not being compacted properly and the height of the building deck being too low. The planting wasn’t at fault and he seemed quite magnanimous about the decision after the event. 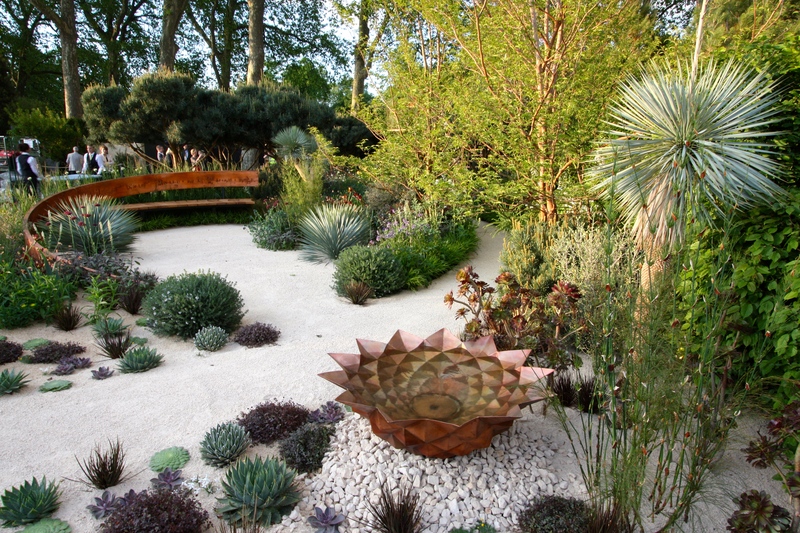 After hearing what any designer goes through in creating a show garden I am not surprised they would be disappointed by anything other than gold! Flash Sale of plants from Nicks garden this Sat 11th June at the Chelsea Physic Garden! Check their website for details!!!! HA!! I’m in the same space boat!! Need to move my neighbours fences!! Your post on Nicks garden has been soooooo helpful!!! & for Nick to miss out on gold owed to hard landscaping!!!! Not cool!!! I agree with that “Best of Show”. From my perch here in Tampa during each broadcast second of the BBC coverage I saw more thought, artistry and passion in that garden than any of the others. I loved the others too, but there were no safe zones in that garden – it was “all in” and that’s the main reason it was so exciting. “All in” is a good way to describe this garden. Certainly, having heard Nick describe the design and build process in detail, it took 100% of his skill and ingenuity and the same from a team of about 75! It was so varied and interesting as you say. Thank you for taking the time to leave a comment. Happy gardening!